I’ve you follow my Instagram or Facebook page, you’ve probably seen my new pegboard! I installed it about a week ago and I honestly can’t imagine my new craft space without it. Even though I have a whole room to myself now, having my pegboard clears up so much space on my sewing table and helps me keep everything in its place. 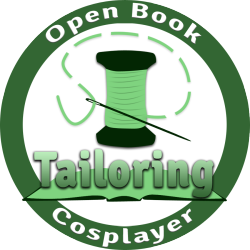 Today, I’ll give you a brief overview of how I put it together and some tips on making your own! Pegboard, cut to your desired measurements (found in the plywood section of your local home improvement store). 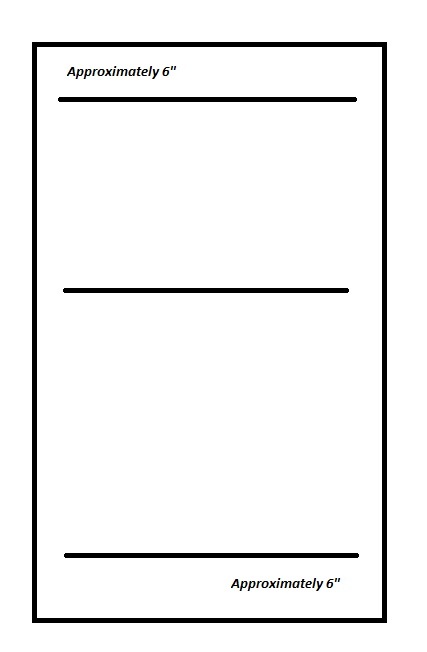 For reference, mine is 2’x4′. Once you’ve gathered all of your required materials, it’s time to figure out where to put your pegboard. Identify the area on your wall and use your stud finder to locate studs. If you don’t have studs available, you’ll need drywall screws and mounts. Otherwise your pretty pegboard will fall on your head! Confession: I did use a stud finder, but either I calibrated it wrong (likely) or my entire wall is made up of wires, in which case it’s very good that I’m still alive to write this (only kind of kidding. Do exercise caution). Mark up where you’re going to place your pegboard. Now it’s time to setup a frame to support your pegboard. Drill the boards into the studs or drywall. I’m a derp and forgot to take pictures of this step, so here’s a mini-guide (but Positively Splendid has a much better one). For reference, I had a 2’x4′ piece of pegboard and used 3 2′ boards horizontally as the base. The top and bottom boards are about 6″ from the edges and the middle board is right in the center. 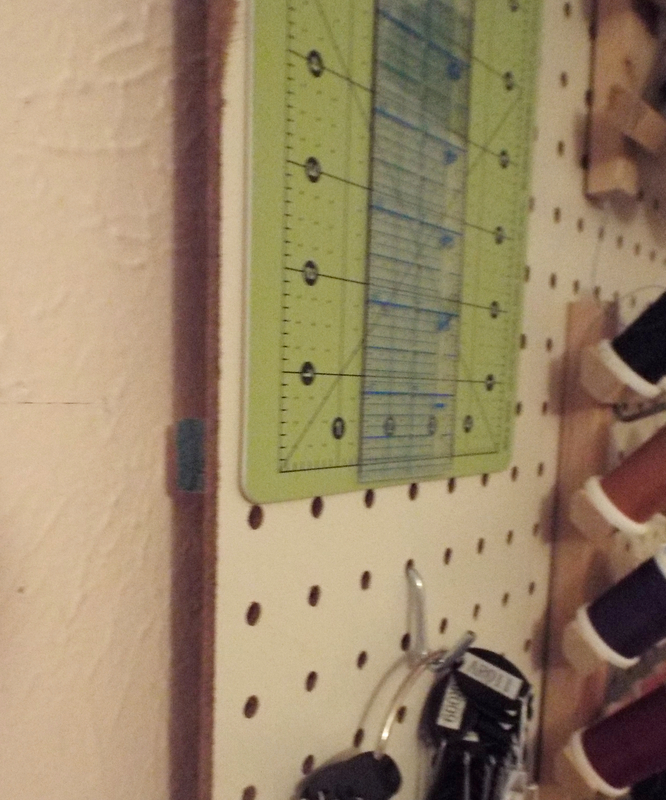 Protip: Measure your pegboard and aim to fit the boards so that the holes of your pegboard are over the frame. This will make screwing the pegboard to the frame much easier. Once your frame is in place, find a willing (or unwilling, but bribe-able) set of hands to help you. Hold up your pegboard and drill the pegboard into the base. I used three screws on the top and bottom shelf. I was a derp (again) and didn’t get the middle shelf lined up properly, so there’s no screws in it. If you plan to put a lot of weight on your board, you’ll need those screws, but my tools are on the lighter side of things, so I’m not super worried. Time to organize and decorate! I picked up a large pegboard organization kit ($10) from Home Depot as well as a set of pegboard baskets ($10) to organize my tools. I definitely should have gone with the small organization kit, but I don’t mind having the extra tools in case I decide to setup another pegboard. I decided to put up all of my high-use tools on my pegboard. My serger and sewing threads were an absolute must on the board, mostly because they take up an absurd amount of space on my desk. I also decided to put up my small rotary board, measuring tools, scissors and rotary cutters, and pliers. I’ve also got a small basket for fabric glue and a quasi-bookshelf that I can use for my iPad. I also put up my color ring from Arda, because it’s too darn pretty to leave in my wig box. I hope this helps anyone looking to make their own pegboard! 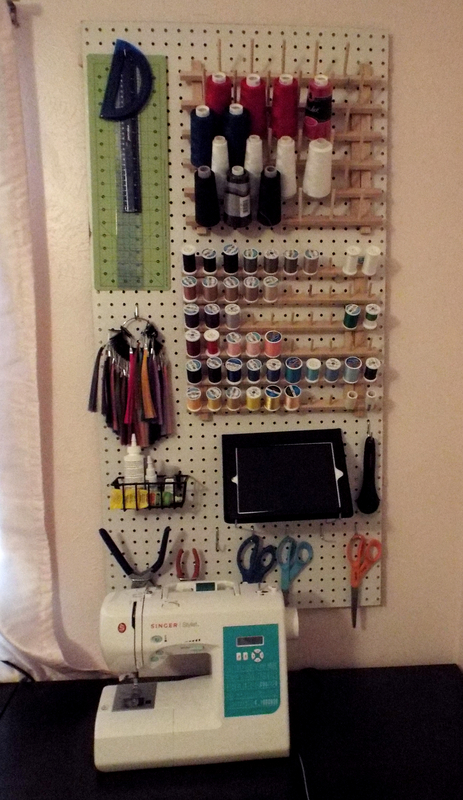 Do you use a pegboard to organize your craft space? If so, please share in the comments! Next week, I’ll show you another new favorite in my craft room: my storage-friendly cutting table! Really helpful and great way to save space hanging them up instead of in drawers or on a surface! Previous Previous post: June Challenge: Hello Bombshell!